There's a reason Galveston Island has a growing reputation for it's impeccable dining and inviting nightlife - and it has everything to do with Saltwater Grill! "Most any time of the year, this stylish Strand-area restaurant is packed to the gills, so reservations are definitely recommended. Shiny stainless-steel buckets produce the menu items identified as "from the kettle:' including a full-bodied-gumbo, the island's best steamed mussels and a lighter version of shrimp scampi. As good as all of these are, the kitchen turns out some of its own wonders. Seafood catches change daily but are always reliable. A recent visit hooked tasty versions of grilled snapper, salmon and sea bass. This restaurant could hold its own anywhere. If it were in Houston, in fact, you would never be able to get a table." Saltwater Grill, located at 2017 Postoffice Street in Galveston, just steps away from The Grand 1894 Opera House. 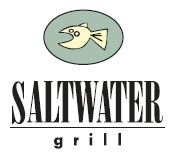 Featuring an array of tantalizing fresh-from-the-grill and fresh-from-the-kettle seafood specialties, Saltwater Grill, is in a class of its own when it comes to quality and attention to detail. But, please, call first for reservations at (409) 762-3474.